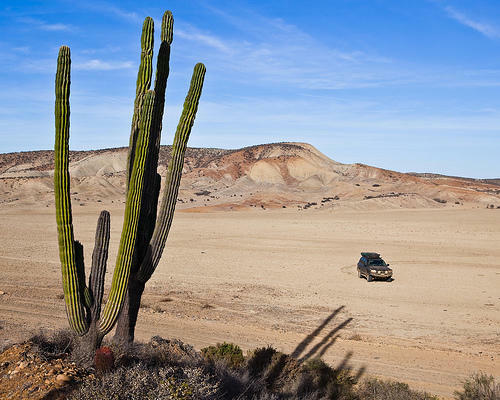 Pictures from my Baja trip in November 2009 can be found here. The first part of the trip was shared with an overland group before I headed south to the southern tip of Baja, Cabo San Lucas. The return journey was via ferry from La Paz to Topolobampo and across the border at Nogales. Interestingly my first attempt to cross was prevented by US Agriculture who stated that I had too much mud on my truck and that I might bring ‘foot and mouth’ or a similar disease into the US! I thought that cleaning ones car at 9.00PM in the evening in Nogales would be easier said than done but after pulling in to a gas station a man ran over with a dirty rag and offered to wipe my wind shield. I pointed at the car and suggested that my windshield was fine but he could help me with the whole car! A few minutes later we agreed a price and soon after I had ten or so people assisting me with the job. Given there was no water tap close by one person relayed buckets and I heated the water using the heat exchanger on my engine. An hour or so later and the truck was deemed passable and I proceeded back to the border where this time round I was fortunately granted permission to cross.